After Black Rock Shooter, Dead Master, and Chariot, it is the time for Nendoroid Strength to get her BRS TV ANIMATION version. 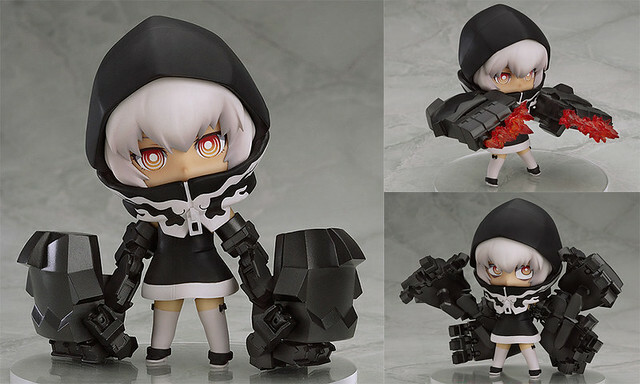 From the series that aired during Fuji TV’s noitaminA block ‘Black Rock Shooter’ comes a Nendoroid of the newly designed version of Strength, the character with glaring red eyes who always keeps her mouth hidden with a hood! Her powerful gigantic ‘Ogre Arms’ are included and are articulated at the fingers for all sorts of different poses – there are a total of four of these gigantic hands to attach, creating some amazing volume! You can even swap out the fingertips to change them into gun barrels and then make use of the included effect parts to recreate epic combat scenes in Nendoroid size! Nendoroid Strength: TV ANIMATION version is priced at 4500 Yen and scheduled for December release. Kahotan has also posted her preview of this Nendoroid, so kindly check out her blog if you are interested to see more close-up shots. This entry was posted in News and tagged black rock shooter, brs, nendoroid, str, strength.